For car buyers who are looking for a sedan that has the perfect combination of style, innovative features, performance and safety, it is difficult to look past the 2018 Altima from Nissan. 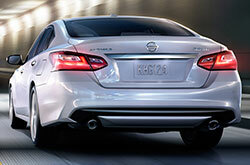 This year's Nissan has the same exterior body style that you may love from last year's model. The body style gives the Altima a sporty yet upscale look that many buyers are drawn to and you can choose from six bold colors. While the exterior of the Altima remains unchanged from last year's model, the interior does hold a few surprises for new car buyers. 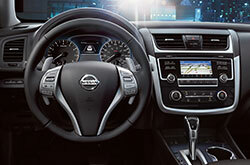 Notably, there are three new features available in the Altima. The first two features are found in all six trim levels for the 2018 Altima from Nissan. These include adaptive cruise control along with an advanced braking system connected to a forward collision warning system. The third new feature available is only in the 3.5 SL trim and it is an integration and pairing system that connects to your smartphone. Nissan has created six distinct trim levels for the new Altima, making it easy for buyers to choose a vehicle with the right combination of features and affordability. The 2.5 S and 2.5 SR are the lowest trim levels available. The more advanced trim levels include the Altima SR Special Edition, the SR Midnight Edition, 2.5 SV and 3.5 SL. 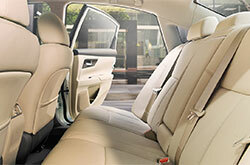 Cloth is a standard material in lower trim levels, and leather is a standard interior material for higher trim levels. You can choose from two interior color choices for both material types. 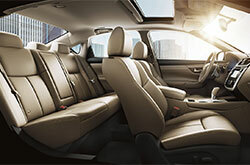 The interior of the 2018 Altima has an impressive design that will make you feel pampered as you drive through town and you will also enjoy access to a wide range of features throughout the cabin. Some of the many convenience features include powered adjustable functions for the driver's seat, a high-quality sound system, light-up vanity mirrors for the driver and passenger, keyless ignition, keyless entry, cruise control with access buttons on the leather-wrapped steering wheel and climate control. During your test drive at a nearby Nissan dealer, you can learn about these and other wonderful interior features available in the 2018 model. While the interior features and the exterior style are important factors to pay attention to when you are preparing to buy your new sedan, the driving experience is also a critical point to consider. You will be able to test drive two standard engines available with different Altima trim levels at your Nissan dealership. Most trim levels for 2018 have a 2.5-liter CVT, four-cylinder engine. The vehicles with this engine perform on the road with 179 horsepower and 177 ft-lbs of torque. The 3.5 SL trim level for 2018 has a 3.5-liter engine that offers slightly more power. All trim levels are a pleasure to drive, and they all are equipped with a tight turn circle, traction and stability controls, a continuous automatic transmission and more. From bumper to bumper, you will find features like rear seat anchors, child safety door locks, headrests for all passengers, airbags throughout the interior, a system for blind spot detection, a system for pre-collision warnings, a remote theft-deterrent system, engine immobilization, ventilated disc brakes, headlights with a daytime running feature and an auto delay off feature and more. Looking for a new sedan that perfectly combines design with performance and safety? Call or visit our Nissan dealership in Grapevine to learn more and test drive your next Nissan Altima.